The 2nd Annual Apprenticeship Forum was held this past Friday, and the event did not disappoint – more than fifty employers and education stakeholders were in attendance to learn more about the apprenticeship training model from a variety of different experts. Employers were provided a wealth of information on different tax incentives and wage reimbursement options from Suzanne Richards who works as a training and development specialist with the Missouri Department of Economic Development. Educators learned about how their districts and campuses could implement different programs and how to market them to their local businesses from Dr. Oscar Carter, Director of Skilled Technical Services with the Missouri Department of Elementary & Secondary Education. And municipalities and other government jurisdictions heard from Richard Kindberg with the Center for Municipal Excellence and Keith Stewart with the City of Edmond, Oklahoma on how the city was able to save hundreds of thousands of dollars via the implementation of a registered program tailored to their public works department. Click HERE to read more on KSN’s coverage of the forum, and click HERE to download a copy of the event’s presentations. For more information, please email Frank Neely at frank@sectorready.org. The Workforce Investment Board of Southwest Missouri was honored by the Missouri Association of Manufacturers last week with the presentation of the Made in Missouri OneSource Alliance Award. The WIB, in partnership with the Job Centers in Joplin, Monett, and Neosho has and continues to work with our areas’s manufacturing and education stakeholders to work to address workforce training needs in Southwest Missouri. Efforts are currently focused on the provision of short-term training meant to provide the foundational skills necessary for jobseekers to enter one of the region’s targeted industries – manufacturing, transportation, construction, and healthcare. Classroom training and other curriculum and practical application are followed by paid work experiences with different employer partners seeking to utilize another pipeline of qualified, credentialed, and work-ready jobseekers. For more information on current and upcoming training offerings, or to apply for these and other jobseeker or business services, please visit www.sectorready.org. McDonald County was recently re-certified by ACT as a Work Ready Community, having met its new NCRC testing, employer support, and supplemental criteria goals. The county was initially certified in May of 2016 after after its local workforce met the preliminary testing requirements of emerging, incumbent, and transitioning workers. Since then the county has met new testing goals and re-engaged and expanded its base of employer support, and has also met additional supplemental criteria required by ACT to complete re-certification. With this CWRC re-certification comes another independent endorsement of the quality of the community’s workforce, helping to aid in the attraction and retention of new and existing businesses. The National Career Readiness Certificate, or NCRC, is a workplace readiness credential offered by ACT that measures an individual’s capabilities with regard to Applied Mathematics, Business Documents, and Graphic Literacy. The credential allows jobseekers an opportunity to demonstrate their skills and abilities to hiring employers, and helps businesses find more qualified and capable candidates for the positions they need filled. McDonald County is the third county in Southwest Missouri to achieve CWRC re-certification, joining Jasper and Newton counties. The NCRC is available free of cost to both jobseeker and employer. Interested jobseekers should contact their local Job Center in Joplin, Monett, or Neosho. Interested businesses can contact Frank Neely at frank@sectorready.org . Southwest Missouri recently saw the addition of two newly developed apprenticeship programs registered with the US Department of Labor – MSW, Inc in Webb City and Cooper Gear & Manufacturing in Anderson. Registered apprenticeship programs are a proven training model businesses can employ to help develop stable and predictable pipelines of skilled workers, and reduce turnover and increase productivity. Employers can partner with local community colleges, tech schools, and other state and federal workforce system partners to develop customized training programs specific to their needs. The Workforce Investment Board of Southwest Missouri offers related, short-term pre-apprenticeship training options specific to a variety of industries. This training includes drug screens, WorkKeys NCRC credentialing, soft skills training, resume preparation, mock interviews, computer skills, and financial counseling in addition to industry specific curriculum. Pre-apprenticeship training helps students and jobseekers get a jump-start on their training and careers, and helps employers screen and recruit qualified candidates. Business interested in learning more can contact Frank Neely at frank@sectorready.org . 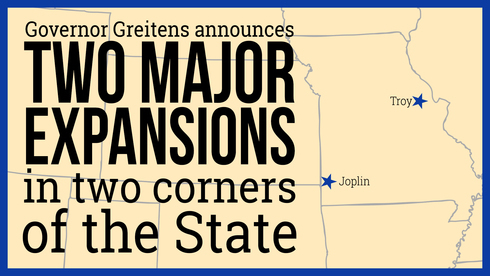 Today, Governor Eric Greitens announced that two Missouri companies operating in the state’s robust food and beverage industry will embark on expansions in their respective communities and create a combined total of 180 new jobs in the state. Witte Brothers Exchange, Inc. offers transport service for temperature-controlled products nationwide from its centrally located office and warehouse. The company utilizes next-generation mobile communication, web-based shipment updates, electronic data interchange capabilities, and much more to the 48 contiguous states it serves. The state is also supporting road improvements near Witte’s operations through a Community Development Block Grant (CDBG) of up to $800,000. The grant was awarded to the City of Troy which will use the CDBG for much needed public infrastructure improvements to the Mennemeyer Road, where Witte and other companies operate. The company is designing a new 80,000 sq. ft. consolidation model and warehouse facility to serve all customer sectors and their new challenges and demands. Jasper Products, LLC, is an industry-leading manufacturer of extended shelf life and aseptically packaged nutritional beverage products serving both private label and contract customers. The company’s $26 million-expansion includes adding processing and production line capacity to meet the companies growing market share and customer base. As part of its expansion, the company will add 75 new jobs to its current workforce of 550. Jasper Products attributes its year-over-year growth successes to a current and productive food processing workforce, strong regional transportation systems and positive growth oriented customer relationships. “This is exciting news not only for Jasper Products, LLC, but also for Jasper County. I’ve watched the company grow since my time as mayor of Joplin, and I’m glad they have the faith in the city and in Southwest Missouri to expand and continue to strive to be the premiere beverage manufacturing facility in North America,” said Senator Ron Richard. “Jasper Products’ recent expansion continues its position as a leading employer in the region and a leading company in its sector nationally. We appreciate the company’s continued commitment to growing in Joplin,” said Rob O’Brian, President of the Joplin Chamber of Commerce. The CDBG program, administered by the Missouri Department of Economic Development, provides grants and loan funds to cities with a population under 50,000 and counties under 200,000 to assist in a variety of public works and economic development projects. To see a full list of businesses embarking on expansions in Missouri, visit https://ded.mo.gov/business-announcements. Help us spread the news through Facebook and Twitter! If you’re looking for a great place to visit, live, get an education, or start a business, you can find resources and information at mo.gov or ded.mo.gov. The Workforce Investment Board of the Southwest Region, Inc. (DBA Workforce Innovation Board), the oversight body for the delivery of employment and training services to the Missouri Counties of Barry, Barton, Dade, Jasper, Lawrence, McDonald, and Newton, is submitting a modification for the region’s official Workforce Innovation Opportunity Act (WIOA) Plan. The plan and proposed modifications will be available during normal business hours to anyone for inspection at the offices of the Workforce Innovation Board, 420 Grand Avenue, Joplin, Missouri, 64801. Additionally, the plan will be available for review on the WIB’s internet website at www.workforcezone.net/plan. The Winter 2017 edition of the WorkforceZone, the region’s quarterly journal for workforce development, features the theme of Workforce Strategies On-Track Amidst Change. The 14-page magazine-style format may be downloaded as a printer-friendly and tablet-friendly PDF. Check out individual articles online here at WorkforceZone.net as well. Competition among employers is on the rise after the boost of economic growth following the recession and Joplin’s disaster recovery momentum. Today’s human resource professional needs to put his or her best foot forward to keep candidate pools flowing. That’s why the WIB and its workforce partners are pleased to announce the All-Star Employer (ASE) program. Employers of Choice need stronger ways to get their message to potential job seekers. Candidates wanting more than just a job can focus on long-term career advancement and other benefits offered by ASE companies. Communities can also recognize local firms that support local causes and routinely give back. The ASE approach helps increase awareness of job opportunities within growth-driven economic sectors. ASE promotes employer champions as advocates that help propel workforce and economic development strategies that improve the entire region. To earn the All-Star Employer designation any local firm can meet a portion of quality criteria. Employers make application directly to the WIB or may be nominated by local Chambers of Commerce, economic development organizations, sector associations, education partners (such as career tech schools or colleges/university training providers), or employees. The WIB designed ASE to provide recognition and public awareness for leading employers. ASE holders would be prominently featured at the entry points at the Joplin, Monett, and Neosho Job Centers. Participating employers can be profiled through the new career pathway tools and videos at the new SectorReady.org. Plaques or window decals may be displayed by employers to showcase their ASE achievements. The WIB can also make official presentations at special events on site through the employer or other community venues. For outreach and recruitment events at the Job Centers, All-Star Employers would receive the highest priority consideration. As economic developers routinely seek to promote local employers as economic assets, the ASE designation helps power the marketing outreach conducted by growth-minded communities. In addition to vast promotional benefits, ASE firms can qualify for special discounts for employer events such as Job Fest and the Workforce Summit. Employers using WorkKeys Job Profiles or other testing services can also use ASE for discounts or fee waivers. All ASE employers will receive complimentary WorkforceZone subscriptions by mail. The WIB plans to debut the official ASE entry guidelines and criteria in March. To qualify, employers would meet some or all of the following quality elements. To introduce the All-Star Employer network, the WIB targeted its service area to include the counties of Barry, Barton, Dade, Jasper, Lawrence, McDonald, and Newton. However, employers from neighboring counties in Arkansas, Kansas, and Oklahoma are encouraged to apply as part of the larger Four-States Labor Market. The WIB plans an extensive public service campaign through local TV, radio, print, and social media throughout the Joplin media market. According to Wikipedia, employer brand is the term commonly used to describe an organization’s reputation as an employer, and its value proposition to its employees, as opposed to its more general corporate brand reputation and value proposition to customers. Likewise, the marketing disciplines associated with branding and brand management have been increasingly applied to the human resources and talent management community to attract, engage and retain talented candidates and employees, in the same way, that marketing applies such tools to attracting and retaining clients, customers, and consumers. The WIB is excited to expand services to local firms to boost their employer branding efforts. The All-Star Employer network aims to launch in March together with the debut of new career pathway tools atSectorReady.org. For more information, or to discuss ideas, contact Jasen Jones at the WIB, jjones@sectorready.org, or by phone to 417-206-1717, Extension 106. The WIB extends its best wishes to Jerri Phillips. Previously an Employer Services Representative (ESR) with the WIB, Jerri recently joined Crowder College Training and Development Solutions. The WIB welcomes Starla Payton to the ESR role, bringing a wealth of experience from the private staffing agency sector. The WIB also welcomes Rob Copher as the new Fiscal Manager to replace Bob Shryock. The WIB bids farewell to Bob, who is retiring after serving since 2010.